A smartphone's battery life is determined by a lot of factors, but the biggest power sink is usually the screen itself. Dimming down the display is the easiest way to slow down on the juice, but a development by Bodle Technologies could resolve that issue altogether. While still in very early stages of development, Bodle Technologies has reportedly been getting significant, though undisclosed, support to create touchscreens that use virtually no electricity. "You have to charge smartwatches every night, which is slowing adoption," explained Dr. Peiman Hosseini, Bodle Technologies founder and engineer. "If you had a smartwatch or smart glass that didn't need much power, you could recharge it just once a week." In place of constantly illuminating a screen, Bodle's breakthrough uses a phase-change material that changes color when subject to an electrical pulse. Despite using very little energy to function, Bodle claims the screen is still as sharp as an average smartphone screen, even visible in direct sunlight. While interfaces such as e-paper screen allow for low-power, legible viewing, they also compromise on color or image quality, making them less-than-ideal candidates for mobile devices. In a report by Engadget, the technology could have applications outside of smartphones, such as being applied to windows to filter out light or retain heat. 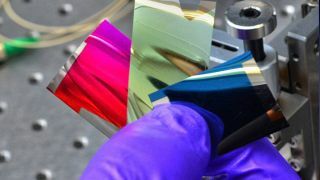 While the promise of super-efficient touchscreens is still a ways away, the technology could forever change the way televisions, smartphones, laptops, and other screened electronics worldwide are developed. The extra savings on the electric bill would make the change welcome alone.